Dog breed gifts for those who love Border Collies! Border Collie Needlepoint Pillows, Collie Cell Phone Cases & Border Collie Tapestry Throw and Afghan! 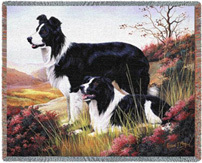 Elegant Dog Breed Gifts, including Border Collie Merchandise and Gift Items. The Ultimate Shopping Mall for Dog Owners and Border Collie Dog Lovers.